I am going to preface this post by saying it is NOT (technically) about potty training. 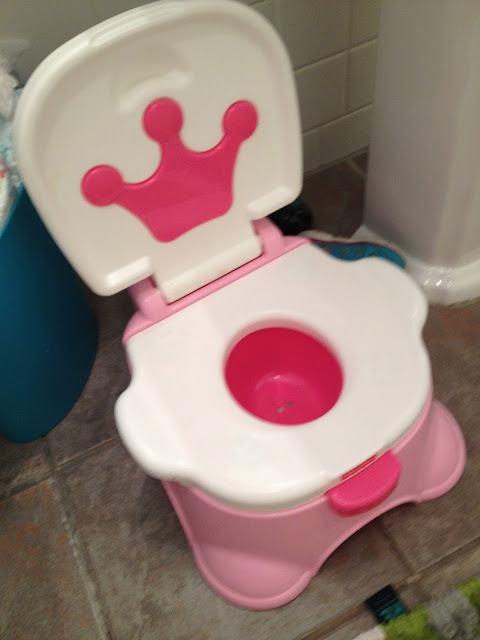 Anyway, this post IS about this ridiculous pink princess potty that I bought for No. I also bought her several seats that fit on a real toilet (which is my preference; I sort of find the little stand alone seats revolting, but, you know, whatever works.) Anyway, this one is super fancy and was the only one available at Target. It is supposed to play celebratory music when you pee in it. It's all dot-dot-dot-DOOO! YAY!!! Somewhere along the way our pretty pink potty malfunctioned and now plays that the celebratory music at all hours of the day and night. Now, the logical thing to do in this situation would be to remove the battery, right? But what, I ask you, is the fun in THAT? Brush your teeth? Do-do-dot-DOOO! YAY!!! Walking down the hall? Do-do-dot-YAY!!! 2 a.m. alarm clock? Do-do-dot-YAY! I wish I had a household appliance that boosted my self esteem! Instead, I have a farm animal puzzle that randomly randomly neighs at me. It happens most frequently when I turn out the playroom lights. Even with the horse piece 100% in place, that horse goes berserk at bedtime. His friends the pig, sheep, cow, rooster, etc are silent all the time, but that horse is a mouthy one. Maybe he's afraid of the dark? Wants to know about Christina Hendricks Husband Christina Hendricks Husband? Visit Our Website.